Lamb and rice are two delicious flavours that are guaranteed to get your puppy’s tail wagging. And when they’re combined with our meaty juices, get ready to watch your pup enjoy himself like never before. 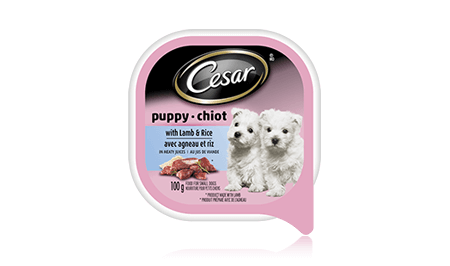 CESAR® Puppy Canine Cuisine with Lamb & Rice in Meaty Juices is formulated to meet the nutritional levels established by the AAFCO Dog Food Nutrient Profiles for growth. MEAT BY-PRODUCT, CHICKEN, LIVER, LAMB, RICE, MINERALS & VITAMINS, CHICKEN BY-PRODUCTS, FISH OIL, CARRAGEENAN, DRIED YAM, COLOUR, XANTHAN GUM, NATURAL FLAVOUR, ERYTHORBIC ACID, DL-METHIONINE, GUAR GUM, SODIUM NITRITE (FOR COLOR RETENTION), SUFFICIENT WATER FOR PROCESSING.